An upgraded Soyuz spacecraft, featuring improved navigation, communications and rendezvous systems, blasted into orbit from Kazakhstan Wednesday and set off on a two-day maiden flight to deliver three fresh crew members to the International Space Station. 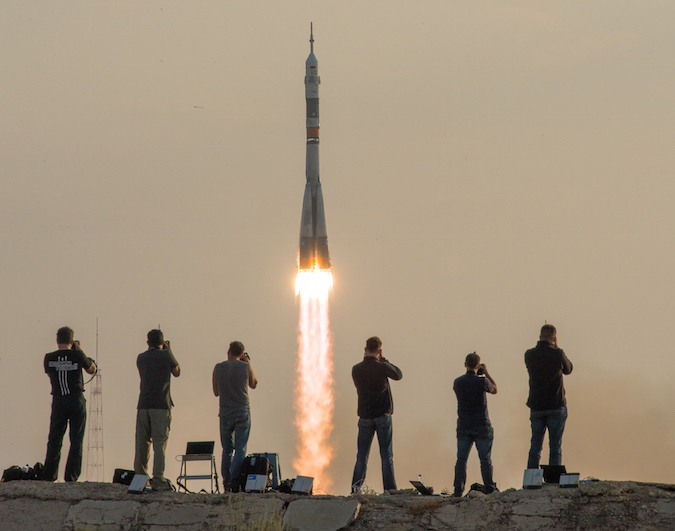 The rocket carrying the Soyuz MS-01 spacecraft — the MS stands for “modernized systems” — thundered to life at 9:36 p.m. EDT (GMT-4; 7:36 a.m. Thursday local time) and quickly climbed away from the Baikonur Cosmodrome, launching directly into the plane of the space station’s orbit. Live television views from inside the crew compartment showed vehicle commander Anatoly Ivanishin, strapped into the cabin’s center seat, calmly monitoring cockpit displays, flanked on the left by Japanese flight engineer Takuya Onishi and on the right by NASA astronaut Kate Rubins. At the moment of liftoff, the space station was passing 250 miles above southern Cameroon near the border of Equatorial Guinea. The flight plan calls for the Soyuz MS-01 spacecraft, launched into the same orbital plane but at a lower altitude, to carry out a two-day rendezvous, catching up with the outpost early Saturday and gliding to a docking at the Earth-facing Rassvet module around 12:12 a.m. Standing by to welcome the crew on board will be Expedition 48 commander Jeffrey Williams, Soyuz TMA-20M commander Alexey Ovchinin and veteran flight engineer Oleg Skripochka, who were launched to the outpost on March 18. 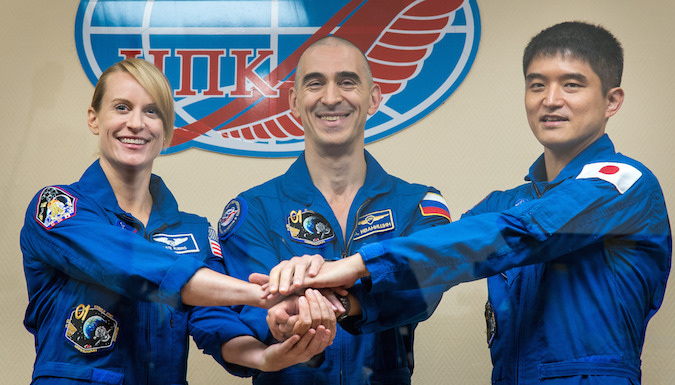 Williams and his crewmates have had the station to themselves since June 18 when Expedition 47 commander Timothy Kopra, Soyuz TMA-19M commander Yuri Malenchenko and British astronaut Timothy Peake departed and returned to Earth after a 186-day mission. But once Ivanishin and his crewmates are aboard and the station crew is back up to six, s full slate of research will be on the agenda, along with vehicle maintenance, one and possibly two upcoming spacewalks and the arrival and departure of a series of supply ships and another Soyuz in September. “We’re very lucky, we have a very busy mission,” said Rubins, who holds a Ph.D. in cancer biology who has made repeated trips to Africa to study ebola and similar viruses. “That’s actually a wonderful thing for astronauts and cosmonauts. We have many visiting vehicles that are arriving, we made do some EVAs and we have a huge research complement of some incredibly interesting experiments on board station. And that includes studying the unseen microbes that share the station with their human crewmates. 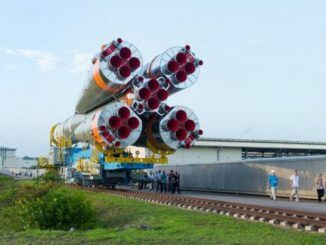 In the near term, Russian engineers were focused on putting the new Soyuz MS spacecraft through its paces during the two-day approach to the station. 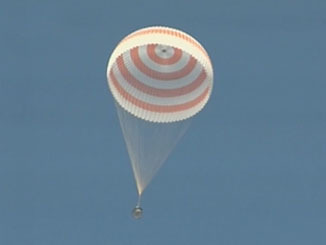 Soyuz ferry ships in recent years have followed an abbreviated four-orbit rendezvous sequence, docking at the lab complex about six hours after launch. But for the first flight of the upgraded MS-series spacecraft, Ivanishin and his crewmates will follow a more traditional 34-orbit rendezvous to give Russian engineers time to thoroughly check out the vehicle’s upgraded systems. The upgrades include additional redundancy in the craft’s maneuvering system and new communications gear that will allow voice and data to be relayed to and from the ground through Russian satellites over 70 percent of each orbit. Earlier TMA-series spacecraft could only send or receive telemetry or commands during passes over Russian ground stations. The spacecraft features an improved docking mechanism, better micrometeoroid shielding, upgraded solar arrays, an additional set of batteries and a reusable “black box” device to record and store a variety of parameters. In keeping with Russia’s incremental approach to flight testing, many of the MS upgrades were first installed and tested on the two most recent unpiloted Progress supply ships to visit the station. 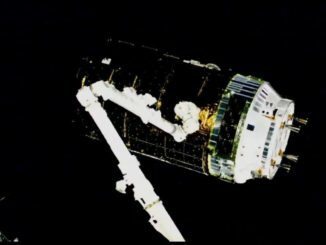 In a final test last week, an MS-series Progress was undocked so Ovchinin and Skripochka could test a system that allows a station crew to remotely pilot an approaching cargo ship.